Director of Sales Operations oversee the overall sales operations of the company or organization, the other core tasks and responsibilities for a Director of Sales operations are providing support in business operations, conducting business processes and ensuring successful performances, keeping accurate track of sales records, assisting in modifying sales operation policies, creating budgets, allocating resources to reach sales operation targets, and monitoring operational performances. They also take charge of delivering strategic sales planning, forecasting plans, analyzing sales operations, modifying and implementing changes to ensure quality effectiveness and work along with managers to enhance productivity and facilitate smooth sales operations. 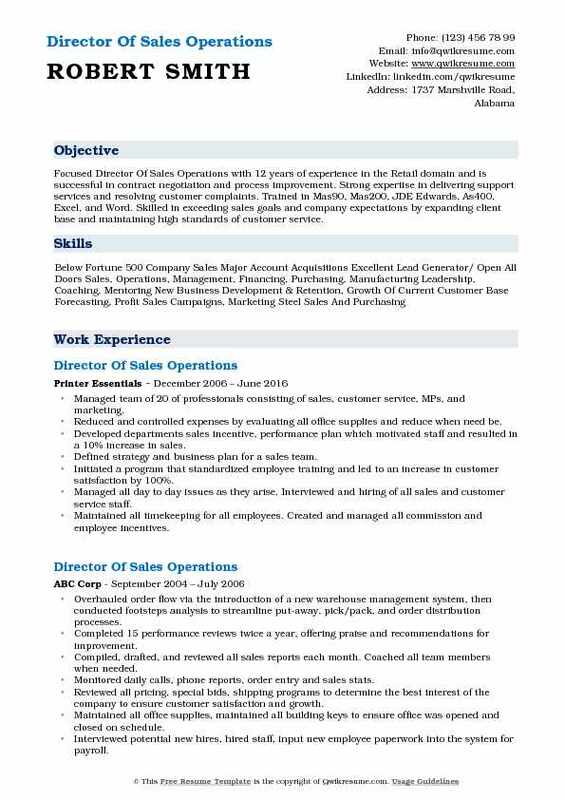 A Bachelor’s degree in the related field is normally seen in the Director of Sales operation Resume. 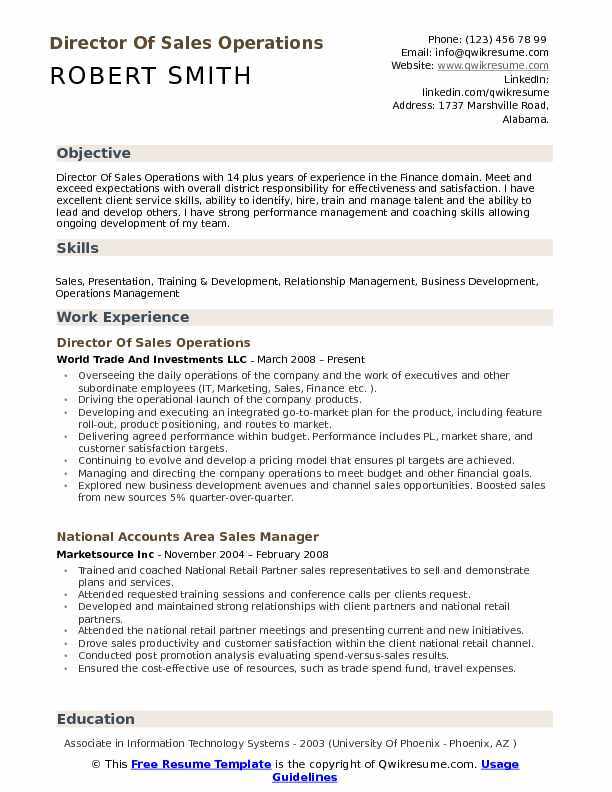 Director of Sales operation must be proficient in basic computer programs, multitasking to handle a variety of sales operations projects at the same time and pay strong attention to details. 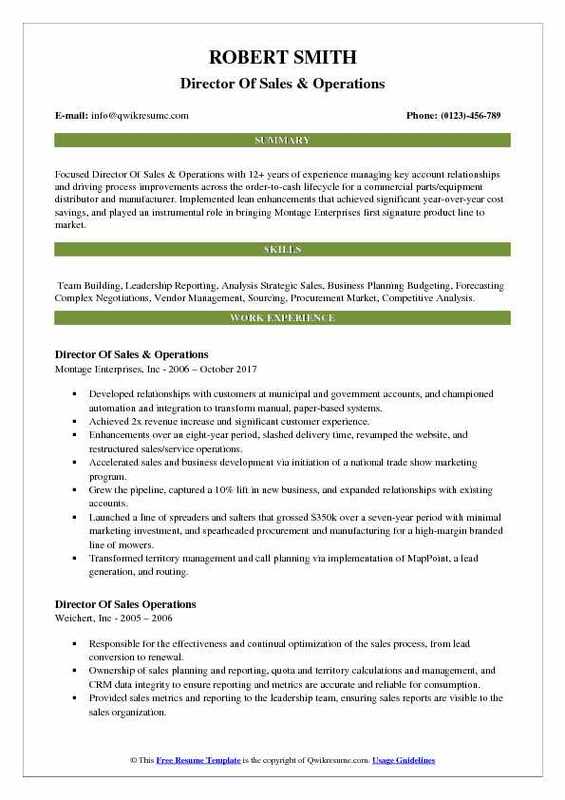 Summary : Director Of Sales Operations with 14 plus years of experience in the Finance domain. Meet and exceed expectations with overall district responsibility for effectiveness and satisfaction. I have excellent client service skills, ability to identify, hire, train and manage talent and the ability to lead and develop others. I have strong performance management and coaching skills allowing ongoing development of my team. Overseeing the daily operations of the company and the work of executives and other subordinate employees (IT, Marketing, Sales, Finance etc. ). Driving the operational launch of the company products. Developing and executing an integrated go-to-market plan for the product, including feature roll-out, product positioning, and routes to market. Delivering agreed performance within budget. Performance includes PL, market share, and customer satisfaction targets. Continuing to evolve and develop a pricing model that ensures pl targets are achieved. Managing and directing the company operations to meet budget and other financial goals. Explored new business development avenues and channel sales opportunities. Boosted sales from new sources 5% quarter-over-quarter. Summary : Motivated and knowledgeable Director of Sales & Operations Manager with 8 years of experience in the Hospitality domain with a vast background in delivering results contributing to the overall success of the hotel. A proven leader that accomplishes performance objectives with a focus on business revenues, customer satisfaction, coordinating, directing, and managing daily hotel operations. Coordinated and supervised various departments to ensure an environment in which high standards of comfort, service, and quality exist for the guests. Maintained positive guest relations and presents an image through our employees which reflects the country inns suites by Carlson philosophy. Utilized Country Inns and Suites by Carlson procedure to properly forecast, budget, and staff each operation department. Actively participated in business, community and civic affairs in the local area. Maintained the physical plant in an attractive and economical manner in compliance with the maintenance and quality assurance policies. Ensured all reports of revenue, expenses, business volume, personnel, payroll, and assets are maintained to country inns suites by Carlson specifications. Ensured all policies, procedures, federal, state and local laws are adhered to by all employees, in regard to personnel, security, guest relations, safety, etc. Summary : Focused Director Of Sales & Operations with 12+ years of experience managing key account relationships and driving process improvements across the order-to-cash lifecycle for a commercial parts/equipment distributor and manufacturer. Implemented lean enhancements that achieved significant year-over-year cost savings, and played an instrumental role in bringing Montage Enterprises first signature product line to market. Skills : Team Building, Leadership Reporting, Analysis Strategic Sales, Business Planning Budgeting, Forecasting Complex Negotiations, Vendor Management, Sourcing, Procurement Market, Competitive Analysis. Developed relationships with customers at municipal and government accounts, and championed automation and integration to transform manual, paper-based systems. Achieved 2x revenue increase and significant customer experience. Enhancements over an eight-year period, slashed delivery time, revamped the website, and restructured sales/service operations. Accelerated sales and business development via initiation of a national trade show marketing program. Grew the pipeline, captured a 10% lift in new business, and expanded relationships with existing accounts. Launched a line of spreaders and salters that grossed $350k over a seven-year period with minimal marketing investment, and spearheaded procurement and manufacturing for a high-margin branded line of mowers. Transformed territory management and call planning via implementation of MapPoint, a lead generation, and routing. Spearheaded procurement and manufacturing processes for the company's first manufactured line of mowers. Led strategic sourcing and global process offshoring negotiations with vendors/suppliers in India, China, and Italy. 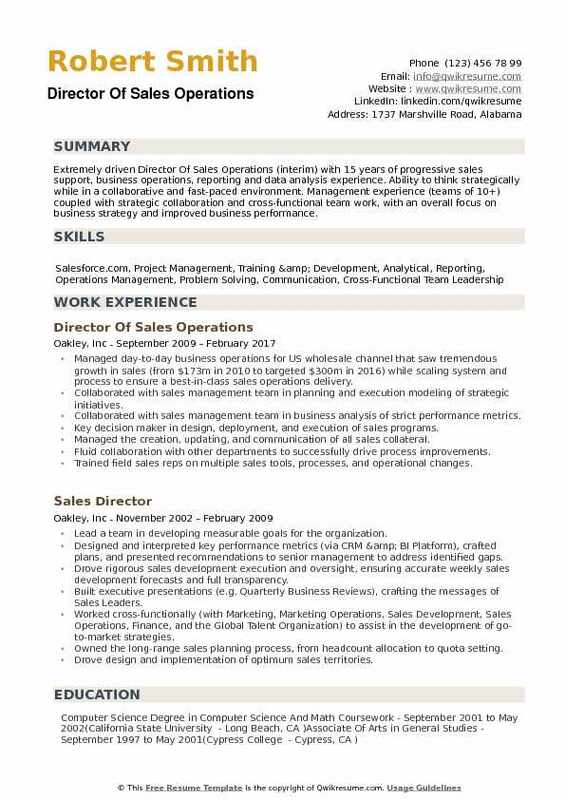 Summary : Director Of Sales Operations with 14 plus years of experience. Lead a sales operations organization to optimize engagement strategy and efficiency. Maintain a consistent growth path with a company revolutionizing their industry. Help develop best in breed process for maximizing sales initiatives and set a new standard for expectations of net new sales, additive sales, and recurring revenue retention. Managing entire portfolio pipeline through complete sales development lifecycle. Responsible for informing, and improving the process to maintain and better a 97%+ annual. Facilitating strategic partnerships to maximize market share, product adoption, customer health, and brand awareness. Presenting weekly analytical overview to internal stakeholders, and executive staff on key performance indicators, sales initiatives, revenue forecast, developing pipeline, and key market. Reviewing product offerings, pricing, and marketing efforts to maximize the potential for each in the hospitality and exploring success in parallel verticals. Leveraging the key performance indicators to drive sales management to maximize efficiency, fine tune. Daily approach, delivery the perfect customer experience and close business. Monitoring the progress through regular management reviews to fully understand each step of the sales. Processing with top prospects in order to more accurately forecast and to keep a management ear to the ground at all times. Successfully integrating four company acquisitions, including evaluating multiple sales cycles,. Summary : Transformative Sr Director Of Sales Operations with 10 years of experience in a broad range of successful leadership roles. Skills include client relationship management as well as empowering staff ranging from agents to VP level to maximize performance and exceed Key Performance Indicators. Experience with multiple industries, including Healthcare, Retail Energy and Travel and Hospitality. Proven track record and experience with implementing and enabling new initiatives. Directed a senior level team of 5 executive level sales staff with regards to developing and achieving sales goals. Provided dashboards that gave the Senior Executives mission-critical intelligence that increased operational and financial forecasting for a pipeline of over $200 million in expected annual revenue. Directed the implementation of salesforce resulting in more efficient, real-time reporting of sales prospects. Directed the design of proposals valued at $87.75 million in projected revenue in first half of 2017. Directed the project management for the due diligence related to C3s recapitalization. Directed a team of 3 Account Executives who provided business intelligence for our sales staff and executive management. Provided daily business intelligence updates regarding prospects and clients to executive management as well as senior management in sales, operations, and client services. Managed the 6-month implementation of c3s new enterprise resource planning system that integrated hr, recruiting, payroll and benefits functions. Chaired weekly and daily project meetings with both internal and external resources to identify and monitor project deliverables and assign resources. Reported project status, milestones, and potential roadblocks on a weekly basis to senior management. 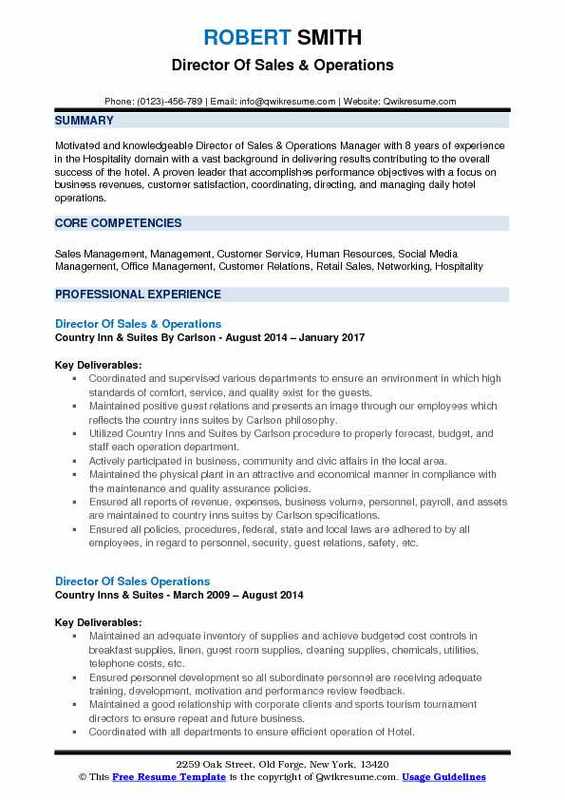 Summary : Focused Director Of Sales Operations with 12 years of experience in the Retail domain and is successful in contract negotiation and process improvement. Strong expertise in delivering support services and resolving customer complaints. Trained in Mas90, Mas200, JDE Edwards, As400, Excel, and Word. Skilled in exceeding sales goals and company expectations by expanding client base and maintaining high standards of customer service. Managed team of 20 of professionals consisting of sales, customer service, MPs, and marketing. Reduced and controlled expenses by evaluating all office supplies and reduce when need be. Developed departments sales incentive, performance plan which motivated staff and resulted in a 10% increase in sales. Defined strategy and business plan for a sales team. Initiated a program that standardized employee training and led to an increase in customer satisfaction by 100%. Managed all day to day issues as they arise. Interviewed and hiring of all sales and customer service staff. Maintained all timekeeping for all employees. Created and managed all commission and employee incentives. Created and implemented all training tools for all systems. Created and implemented all day to day procedures. Helped earn the company #1 resellers choice award in customer satisfaction by decreasing customer dissatisfaction and increasing positive service level. 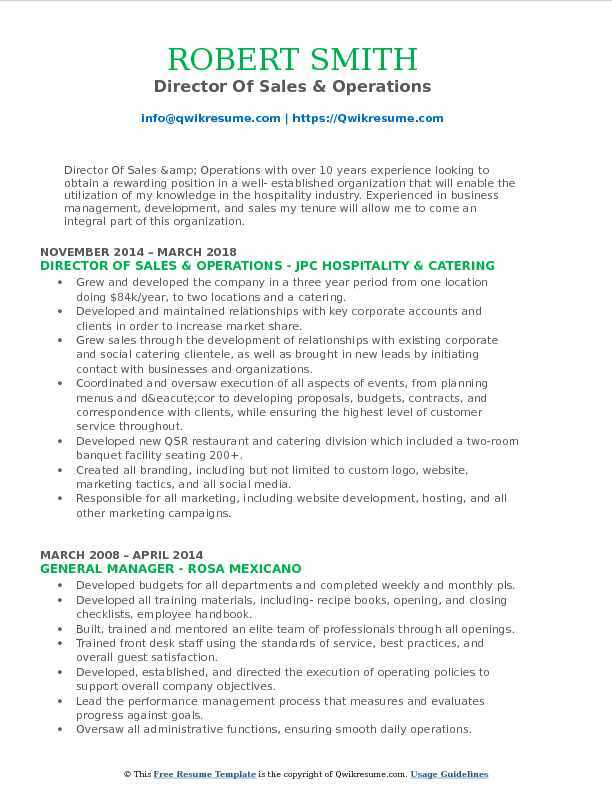 Summary : Director Of Sales & Operations with over 10 years experience looking to obtain a rewarding position in a well- established organization that will enable the utilization of my knowledge in the hospitality industry. Experienced in business management, development, and sales my tenure will allow me to come an integral part of this organization. 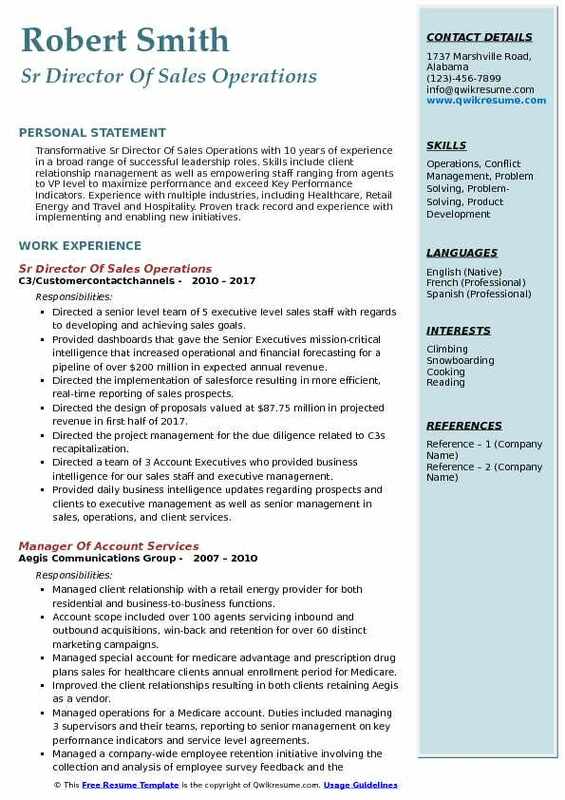 Skills : P&L, SAAS, Six Sigma, Sales Management, Sales Support, Sales Operations, Forecasting, Change Management, Process Improvement, Collaboration, Relationship Building, Relationship Management, New Business Development, Outsourcing, Channel Marketing, Cross-Functional Team Leadership, Critical Thinking, Crisis Management, Talent Acquisition. Grew and developed the company in a three year period from one location doing $84k/year, to two locations and a catering. Developed and maintained relationships with key corporate accounts and clients in order to increase market share. Grew sales through the development of relationships with existing corporate and social catering clientele, as well as brought in new leads by initiating contact with businesses and organizations. Coordinated and oversaw execution of all aspects of events, from planning menus and décor to developing proposals, budgets, contracts, and correspondence with clients, while ensuring the highest level of customer service throughout. Developed new QSR restaurant and catering division which included a two-room banquet facility seating 200+. Created all branding, including but not limited to custom logo, website, marketing tactics, and all social media. Responsible for all marketing, including website development, hosting, and all other marketing campaigns. Used analytical tools and internal resources to determine performance. 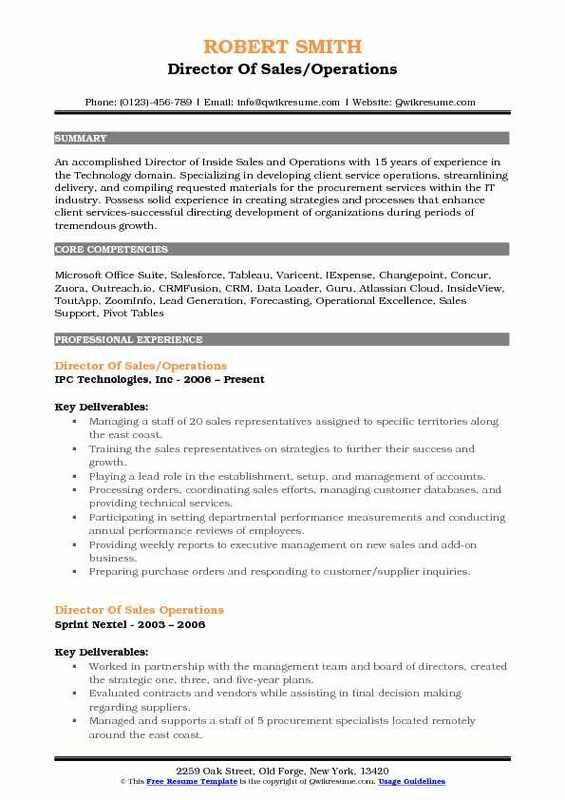 Summary : An accomplished Director of Inside Sales and Operations with 15 years of experience in the Technology domain. Specializing in developing client service operations, streamlining delivery, and compiling requested materials for the procurement services within the IT industry. Possess solid experience in creating strategies and processes that enhance client services-successful directing development of organizations during periods of tremendous growth. Managing a staff of 20 sales representatives assigned to specific territories along the east coast. Training the sales representatives on strategies to further their success and growth. Playing a lead role in the establishment, setup, and management of accounts. Processing orders, coordinating sales efforts, managing customer databases, and providing technical services. Participating in setting departmental performance measurements and conducting annual performance reviews of employees. Providing weekly reports to executive management on new sales and add-on business. Preparing purchase orders and responding to customer/supplier inquiries. Reviewing requisition orders to verify accuracy, specifications, compare prices, delivery dates, and determine the best vendor. Preparing, maintaining, and reviewing the purchasing files, report price lists, tracking the status of requisitions, contracts/orders, locating suppliers, approving bills for payment, monitoring contractor performance and in-house inventory forms. 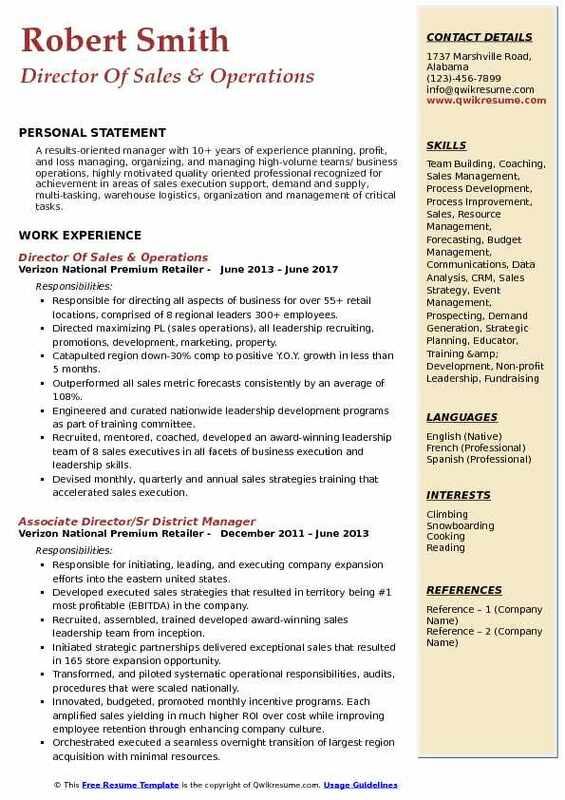 Headline : A results-oriented manager with 10+ years of experience planning, profit, and loss managing, organizing, and managing high-volume teams/ business operations, highly motivated quality oriented professional recognized for achievement in areas of sales execution support, demand and supply, multi-tasking, warehouse logistics, organization and management of critical tasks. Responsible for directing all aspects of business for over 55+ retail locations, comprised of 8 regional leaders 300+ employees. Directed maximizing PL (sales operations), all leadership recruiting, promotions, development, marketing, property. Catapulted region down-30% comp to positive Y.O.Y. growth in less than 5 months. Outperformed all sales metric forecasts consistently by an average of 108%. Engineered and curated nationwide leadership development programs as part of training committee. Recruited, mentored, coached, developed an award-winning leadership team of 8 sales executives in all facets of business execution and leadership skills. Devised monthly, quarterly and annual sales strategies training that accelerated sales execution. Negotiated $2.5mm in co-op funding agreement, secured by surpassing +30% Y.O.Y. sales. Reduced bottom line losses by over $800k by streamlining operational systems that initiated organizations SOPs. Developed sales analytics tools including, KPI leadership reports to provide timely, accurate, actionable data. Formed fortified strategic partnerships w/fortune 500 companies to max new revenue streams. 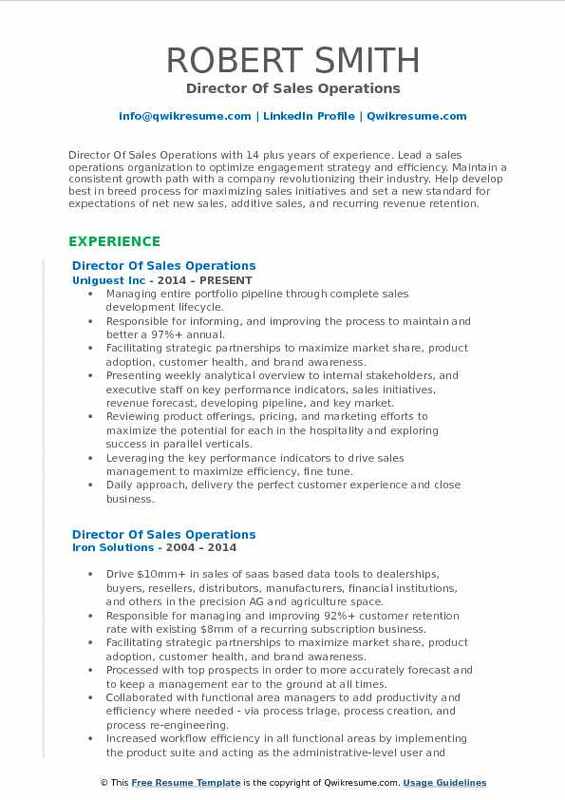 Summary : Extremely driven Director Of Sales Operations (interim) with 15 years of progressive sales support, business operations, reporting and data analysis experience. Ability to think strategically while in a collaborative and fast-paced environment. Management experience (teams of 10+) coupled with strategic collaboration and cross-functional team work, with an overall focus on business strategy and improved business performance. Managed day-to-day business operations for US wholesale channel that saw tremendous growth in sales (from $173m in 2010 to targeted $300m in 2016) while scaling system and process to ensure a best-in-class sales operations delivery. Collaborated with sales management team in planning and execution modeling of strategic initiatives. Collaborated with sales management team in business analysis of strict performance metrics. Key decision maker in design, deployment, and execution of sales programs. Managed the creation, updating, and communication of all sales collateral. Fluid collaboration with other departments to successfully drive process improvements. Trained field sales reps on multiple sales tools, processes, and operational changes. Ensured data integrity for reporting and business analysis by managing changes to customer master. Proactively managed inventory allocation strategy adjustments during critical shipping periods. Managed all SOX compliance documentation, outlining policies and procedures, and audit process for us. Key decision maker in multiple large-scale integrations, including organizational realignments, SAP system.